Wild Game ... the perfect food! I have a close friend that I went to college with and we used to fish the trout streams of north central Nebraska with great success. The years went by and jobs and family seemed to take up our free time and there was little opportunity to get together. A couple of years ago he said to me, “Let’s you and I go fish Oahe for some walleye and whatever we can come up with.” This was not only an opportunity to renew an old friendship but to catch some fish with an old friend. While we always stayed in touch, this was the first opportunity we had to get together in decades. He told me about exciting experiences he had fishing for salmon off the face of the Oahe dam in 70 to 100 feet of water. He fishes for salmon with a gentleman that just loves to fish for salmon more than any other specie and he likes the lake. So as we visited during the winter months, he assured me that we would go salmon fishing this year. Ongoing – 24 Picks, Every 24 hours. Now to do some research about salmon in South Dakota. I know how to cook and eat them. Walleye and Northern Pike along with other popular local game fish. The state decided to introduce a new species that could tolerate the limiting factors created by the thermal stratification and add to the sport fishery. In the 1970’s the state of South Dakota introduced the kokanee salmon and lake trout in Lake Oahe. Neither introduction was successful. At the same time the state of North Dakota ran experiments in Lake Sakakawea, also a reservoir on the Missouri River. North Dakota focused on food chain based on rainbow smelt, a fish species used as food by other species. The smelt reproduced, migrated downstream, and then became abundant in Lake Oahe by 1977. Chinook salmon was introduced to feed on the smelt that appeared in Lake Oahe in 1979 and 1980. Because of the success of these two species and the state’s commitment to providing quality sport fishing opportunities, South Dakota implemented its own chinook salmon program. Chinook salmon are an anadromous species. However, there are some strains that live their entire life cycle in fresh water. 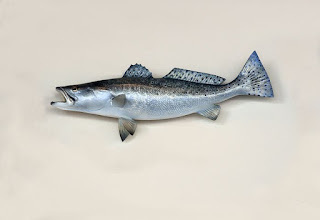 One such strain, Lake Michigan Chinooks, provided the eggs for South Dakota’s initial efforts. Like their ocean dwelling relative, these fish make an autumn spawning run up a fresh water stream just before the end of their lives. Stream water quality and clarity are important in successful spawning locations. Lake Oahe tributaries are turbid in the autumn, so there was not a good location for Lake Oahe salmon to spawn. Thus, Whitlocks Bay Spawning and Imprinting Station was built. It is located on the eastern shore of Lake Oahe, 18 miles west of Gettysburg. South Dakota first stocked its own Chinooks in April 1982. 175 adult fish returned to Whitlocks Station. In 1990, 1107 salmon returned, and approximately 787,000 eggs were collected. The goal of the salmon program was to collect eggs and raise enough fish to stock size and to maintain the sport fishery in the lake. The salmon would live their lives without human contact-unless they were caught by the angler. At Whitlocks, eggs are removed from females between mid-September and the end of October every year. The fertilized eggs are incubated at fish hatcheries around South Dakota, and the individual fish which live to 3 to 6 inch size, are held until late April or early May. They are then returned to Whitlocks Station and kept in ponds during which time imprinting occurs. (Imprinting is an irreversible learning experience that provides the fish with the ability to return to a selected site). After release, the fish will spend 3-4 years maturing in the lake. Adults ready to complete the life cycle return to Whitlocks and swim up a fish ladder and into a holding pond created for them. Originally, fish were stocked when they reached 3.5 inches in length. By keeping them at the hatcheries until they reach 5 inches, twice as many survive. This information was take from “Publication of Hooks and Ladders funded by S.D. Project WILD, S.D. Dept. Game, Fish and Parks.